One of the benefits of a Dedicated Server is that the combination of port forwarding and the server's static IP address lets you run internet-accessible services on machines which connect to the internet through Speedify. Port forwarding allows computers on the internet to connect to a service that is actually running on one of your computers which is connected to the Dedicated Server via Speedify. The client request will go to a port on the Dedicated Server, which will then send the request over the bonded and encrypted Speedify connection of the correct connected computer. It is only available to Speedify for Teams customers who have purchased a Dedicated Server. Requests for forwarded ports when connecting to a public Speed Server are ignored. If you request a port which is already being forwarded to another client of your Dedicated Server, then your attempt to connect fails and you are shown an error message. Using this interface, you can add new port forwarding rules. Type a port number, select TCP or UDP and then click the + to add another rule. Ports 1024 through 49151 can be forwarded (either TCP or UDP). Each client may have a maximum of 20 ports forwarded. 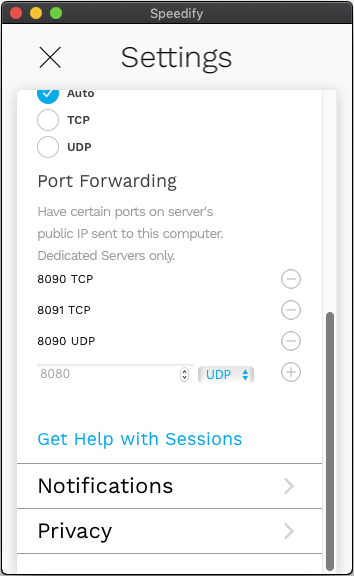 Port forwarding is also available in the Speedify command line interface. For computers that are acting as a server via port forwarding, it is common to use the CLI to script the commands to ensure that that right ports are forwarded to the right machine.